Dubai: India’s Jet Airways on Monday grounded four aircraft as it failed to pay the lease for renting them — the latest in a series of financial challenges hurting the airline. Jet Airways did not elaborate on which routes will be affected or how long the grounding is for. It has, however, cancelled flights to and from Abu Dhabi for an indefinite period, due to what it described as “operational reasons.” A travel agent from the airline’s office in Abu Dhabi told Gulf News that flights to Abu Dhabi will be suspended until March 30. Jet Airways did not respond to comments about those details. Abu Dhabi-based Etihad Airways, which owns a 24 per cent stake in Jet, confirmed on Monday the cancellation of “a number of flights” without citing details. It urged passengers to contact their travel agent or the Etihad contact centre for assistance. It also said it is “working closely” with Indian lenders, Jet Airways, and “key stakeholders to facilitate a solution” for the illiquid airline. With the additional four aircraft that are now grounded, Jet Airways has a total of 41 aircraft that are non-operational due to failure to pay rentals, according to reports from India Today. The groundings come as cash-strapped Jet Airways seeks funds from investors, according to Bloomberg News reports, as it hasn’t seen profits in nine of the past 11 fiscal years. With over $1 billion (Dh3.7 billion) in debt, the airline has also had to contend with a challenging 2018 amid competition from low-cost carriers and as both a weaker rupee and higher oil prices hurt earnings. “The company is making all efforts to minimise disruption to its network… and is proactively informing and re-accommodating its affected guests,” the letter to the Indian bourse said. Share prices of the carrier have been on the decline since January 2018, falling to less than a quarter of where they stood. Between early January and late September 2018, Jet’s share prices have dropped to Rs180 from Rs870. They gained some ground in late 2018, but have been on the decline since the start of 2019, currently trading at Rs236. 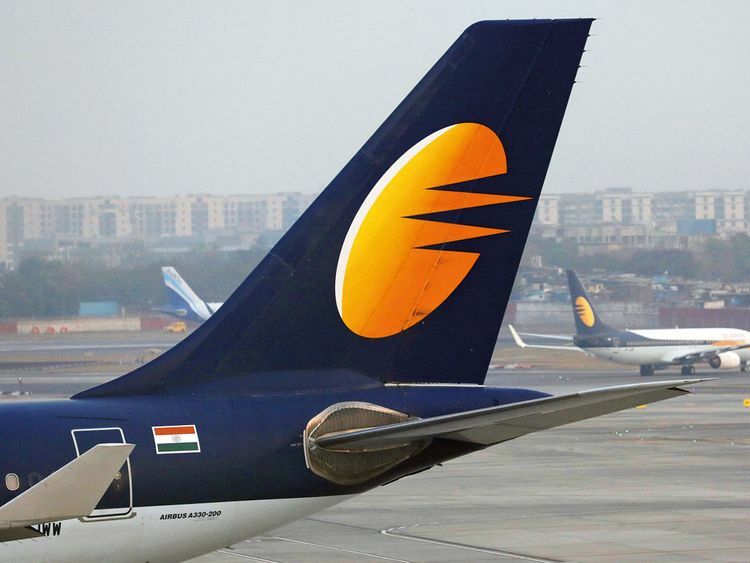 In January, Etihad Airways, which held a 24 per cent stake in Jet Airways, reportedly agreed to raise that stake to 49 per cent as the Indian carrier’s founder and chairman gives up majority control of Jet, Bloomberg News also reported. When asked by Gulf News, Etihad said its stake in the Indian carrier is currently at 24 per cent, without commenting on reported plans to raise it. Etihad has owned stakes in Jet since 2013. Reports from India’s Economic Times say that Jet Airways has a March 18 deadline to decide on an update for the airline’s turnaround, with an Etihad team reportedly expected to visit Mumbai this week to discuss the matter.